Klaas-Jan Huntelaar (r.) - scorer of 12 goals in 15/16 - proved popular with the Chinese fans. FC Schalke 04 have been greeted by hundreds of euphoric fans at the Guangdong Stadium in Guangzhou - the first stop of the club's maiden trip to China. 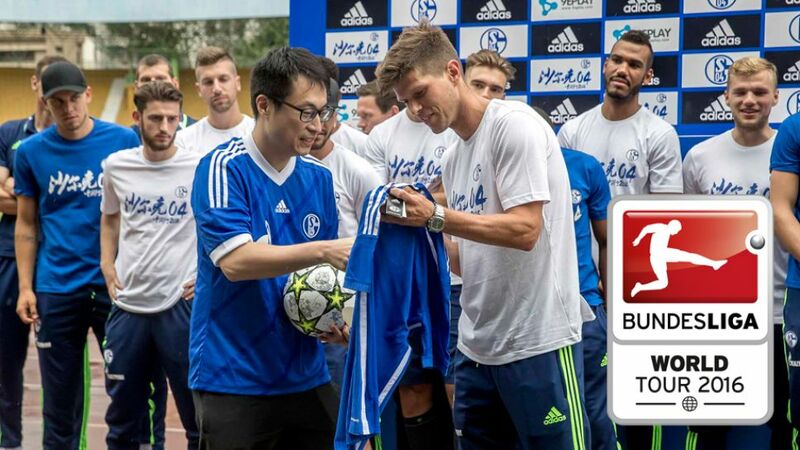 "It was simply overwhelming, the welcome we received," said Schalke's top scorer in 2015/16 Klaas-Jan Huntelaar. "I am looking forward to my time here." Huntelaar and midfielder Johannes Geis then challenged the local fans to ball-juggling competitions - although the players used plastic fruit instead of footballs. Schalke sporting director Christian Heidel is delighted for the team-building opportunity. "When we return, we will all know each other better," he said. "To me it is extremely important that the group is not just the players, but every individual who plays a role at the club. Such a trip can ensure that we grow together even more." Schalke will take on Guangzhou R&F FC on Tuesday before facing Luiz Felipe Scolari's Chinese Super League champions Guangzhou Evergrande Taobao FC on Thursday. To keep up-to-date with Schalke's progress in the Far East, follow the hashtags #SchalkeInChina and #BLWorldTour on Twitter.